This entry was posted in Life, Love and the Universe and tagged Burren, humble, majesty, plant, scant, small. Bookmark the permalink. Yesterday I spoke with 21 men of varying ages (one at a time), all suffering from spiritual, intellectual, affectional, and physical desolation. I needed your post today to help quell a lingering and inexplicable sadness. Dear Tom, I think my post today must have been prompted especially for you, I hope your sadness is short lived. 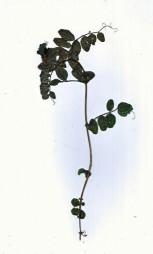 The picture of the tiny Burren leaf-stem, was not a recent one, but it has always been a favourite of mine. The vulnerability of something so fragile, pushing it’s way upwards and into what appears at first sight to be a barren landscape, and then to find itself surrounded with incredible beauty where only the strongest survive, is a truly magnificent achievement. God Bless. Thank you, Teri, for your blessing and for your “hearing” my reaction to your post. so nice, both words and image…i love short poetry. Thank you Virgilio, the burren leaf seemed such a fragile little thing, I pressed it in a book and when it was completely dried, I took the photograph. This was many years ago but I have only just found the right words for it, at least they seemed right to me. A Haiku.